All the products shown below have been designed and made by me. Click on the thumbnail to see a larger picture. If you wish to place an order please click here for a printable order form. These little Christmas Cards come ready to hang on your doll’s house wall. 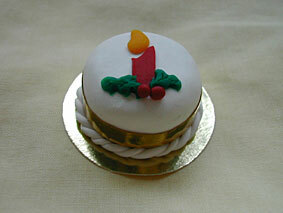 They are attached to 2 red ribbons with Santa motifs at the top. The ribbons are each approx 12cm in length. 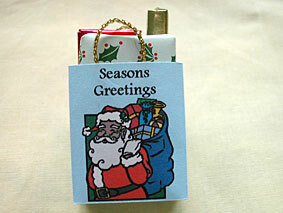 Each card has a seasonal message inside, ‘Happy Christmas’, ‘Merry Christmas’ or ‘Seasons Greetings’. Here is a bulging Christmas stocking full of presents. 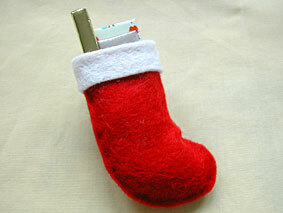 Put it under the tree or at the foot of the bed to make your Christmas scene complete. (Please note that the presents do not come out of the stocking). 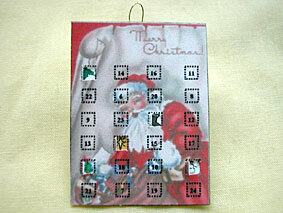 No festive season is complete without an Advent Calendar for the children. This one measures approx 3.75cm x 2.5cm and comes with 5 opening doors each with a different picture underneath. All wrapped up and ready to be delivered. These 3 presents come in a Santa design carrier bag. They are loose in the bag so can be removed from the bag if you wish. It’s Christmas Eve and the children are waiting for Santa to come. There are 2 empty stockings for the end of the bed, complete with a wish list (both boy and girl versions included), a mince pie for Santa and a carrot for Rudolph. Just in case it’s a long wait there is the book ‘The Night before Christmas’ to read (please note the book does not open). This is a set of 6 matching placemats and drinks coasters for your Christmas dining table. 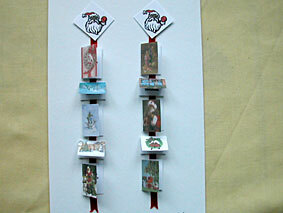 Each one has a festive picture on it and is cork backed just like the real thing. The mats measure approx 2.8cm x 1.6cm and the coasters 0.8cm square. Place these Christmas Cards around the room to give your dolls house a festive look. 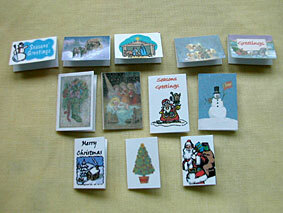 Each card has a seasonal message inside, ‘Happy Christmas’, ‘Merry Christmas’ or ‘Seasons Greetings’. They measure approx 1.8cm x 1.2cm, 1cm x 1.5cm and 1.5cm x 1cm. 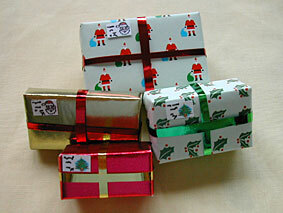 A selection of 4 Christmas parcels. 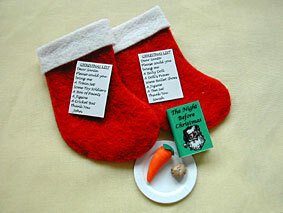 Put them under the tree or at the foot of the bed to make your Christmas scene complete. The parcels measure approx, 4 x 2.5 x 1.3, 3 x 2 x 1.3, 3.5 x 2 x 0.5 and 2.5 x 1.4 x 1.4 (cm). Get your dolls in the mood for Christmas with these books and LPs. There are 2 books for the children, ‘The Christmas Story’ and ‘Santa Claus’ and a Christmas recipe book for Mum so she can pick out some lovely things to cook during the festive period. 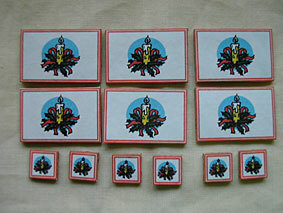 The books measure approx 2.5cm x 2cm, 2cm x 1.4cm and 2.2cm x 1.6cm. 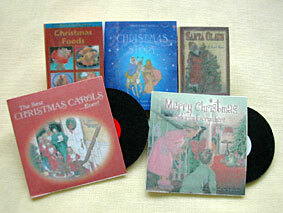 Whilst reading they can listen to some Christmas music, either Christmas Carols or a selection of children’s Christmas songs. Each of the record sleeves measures 2.5cm square and contains a cardboard ‘record’. Please note that the books do not open. Here’s something for the children to do while they’re waiting for Christmas to arrive. 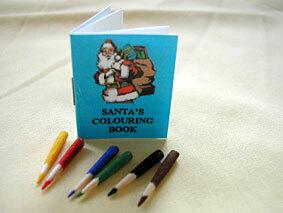 The colouring book measures approx 2.5cm x 1.9cm and has 8 different festive pictures in it all ready to be coloured in. It comes complete with 6 little pencils.